Australian Prime Minister John Howard has led tributes to naturalist Steve Irwin who was killed by a stingray while diving off the Queensland coast. 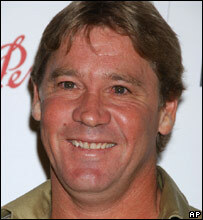 He was known for his Crocodile Hunter TV show and his work with wildlife. Mr Irwin, 44, was struck in the chest by a stingray's barb while filming a documentary on the Great Barrier Reef. The prime minister said that he had known Mr Irwin well, and that the country had lost a "wonderful and colourful son". Mr Howard said he was "quite shocked and distressed at Steve Irwin's sudden untimely and freakish death". "It's a huge loss to Australia - he was a wonderful character, he was a passionate environmentalist, he brought entertainment and excitement to millions of people." Australian Foreign Minister Alexander Downer and Queensland's Tourism Minister Margaret Keech praised Mr Irwin for his work saying he had done a lot to promote Australia to the rest of the world and would be greatly missed. British zoologist Mark O'Shea said his death would leave an "immense hole" in the worlds of both conservation and television, adding that Irwin had "paved the way" for other people to work in those fields. That view was echoed by British naturalist and TV presenter David Bellamy who said he had wept upon hearing the news. Mr Bellamy called him "one of the great showmen and conservationists". "He did take enormous risks, but he knew what he was doing. It was one of the terrible, terrible, terrible accidents and I wish to God it didn't happen," Mr Bellamy told the BBC. UK wilderness expert Ray Mears said that Mr Irwin's death was a tragedy and that his thoughts were with his family, but that the incident served as a warning that "some things in nature should be left alone". "He clearly took a lot of risks and television encouraged him to do that," Mr Mears said. "The voyeurism we are seeing on television has a cost and it's that cost Steve Irwin's family are paying today." The incident happened at Batt Reef, off Port Douglas in Queensland, while Mr Irwin was being filmed snorkelling with bull stingrays. "He came over the top of a stingray and a barb, the stingray's barb went up and put a hole into his heart," Mr Irwin's manager John Stainton told the BBC. "We got him back within a couple of minutes to Croc 1, which is Steve's research vessel, and by 12 o'clock when the emergency crew arrived they pronounced him dead." 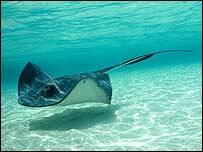 The flat, triangular stingray gets its name from the razor-sharp barb at the end of its tail, coated in toxic venom. But the animal only uses this weapon defensively when it feels threatened or is stepped on. Attacks on humans are a rarity - only two other people are known to have died in Australia from a stingray attack. Experts say that while painful, stingray venom is rarely lethal and it would have been the wound caused by the barb itself which proved fatal. Mr Irwin was famous for handling dangerous creatures such as crocodiles, snakes and spiders, and his documentaries on his work with crocodiles drew a worldwide audience. But he also courted controversy with a series of stunts. He sparked outrage across Australia after cradling his one-month-old son a metre away from the reptile during a show at Australia Zoo. An investigation was launched into whether Mr Irwin and his team interacted too closely with penguins and whales while filming in the Antarctic, but no action was taken.